Shame it likely won't be sold in America. 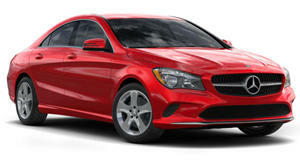 Mercedes keeps expanding the bottom rung of its lineup with more models. And now it's revealed one more. Only this one we don't expect to find in US showrooms. It's the new CLA Shooting Brake – the longer-roofed version of the CLA four-door coupe we already know, and the replacement for the last one that wasn't sold in North America, either. Which is a bit of a shame, because this time around the German automaker has given it a lot more space inside to make it a much more usable and versatile vehicle. Like the four-door version (and so many other vehicles on the market), the new Mercedes-Benz CLA Shooting Brake has grown in just about every dimension. It's almost two inches longer and over two inches wider, thanks to its 1.2-inch longer wheelbase and 2-inch wider track. It's only a fraction lower and the door mirrors are narrower. The larger footprint translates to more headroom, legroom, elbow room, and shoulder room inside. But the greater improvement is in its cargo capacity, which is more expansive not only than the four-door, but the previous wagon as well. The cargo compartment is both deeper and wider to give it 610 cubic inches more capacity, and it's accessed by a 9-inch wider tailgate opening. And that could come in handy. Otherwise it's pretty much the same vehicle (from the C-pillar forward) as the second-generation CLA four-door coupe, and will likely offer the same powertrain options – including gasoline and diesel engines, manual and dual-clutch transmissions, and front- or all-wheel drive – when it reaches dealers in September. Those just likely won't include ours, so we'll just have to choose between the four-door, the taller GLA crossover, or the bigger E-Class wagon.